Congratulations to Masha Fedzechkina on her article on a bias for efficient information transfer during language learning that has just appeared in the Proceedings of the National Academy of Sciences (link to article). Thanks to the extended podcast coverage by the Skeptic’s Guide to the Universe, which present an interesting take on our study (a couple of details about ambiguity vs. uncertainty are a bit off, but the general message is captured well). Have a look at minutes 13:30 to 22:02. Thanks to Nick Kloehn for making us aware of this piece. Georgetown University (PNAS Study: Language Structure Arises from Balance of Clear and Effective Communication). Errata: We are sorry that in our paper we forgot to acknowledge the help of three undergraduate research assistants, Andy Wood, Irene Minkina, and Cassandra Donatelli, in preparing the video animations used during our artificial language learning task. This entry was posted in articles, etc., Papers, presentations, Press and tagged artificial languages, case-marking, communication, efficiency, Fedzechkina, information transmission, language acquisition, word order. Congratulations to Dave Kleinschmidt and Masha Fedzechkina for being awarded LSA stipends to attend the Linguistics Society of America’s 2011 Summer Institute at UC Boulder! This entry was posted in HLP lab and tagged Fedzechkina, Kleinschmidt, LSA. 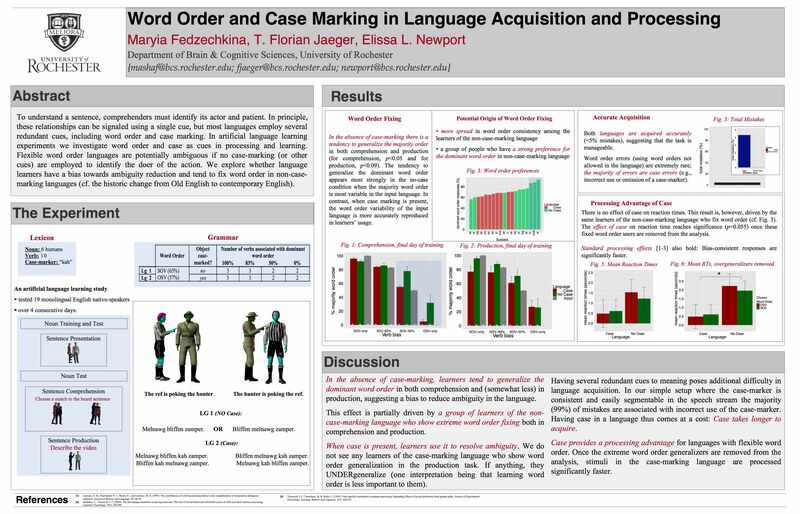 We presented the results of our artificial language learning study on the use of case-marking and word order as cues in processing and learning at the LSA annual meeting. This is work done with Florian Jaeger and Elissa Newport. We investigated whether functional pressures (e.g., ambiguity reduction) operate during language acquisition, biasing learners to (subtly) deviate from the input they receive. Our results suggest that language learners indeed have a bias to reduce uncertainty (or ambiguity) in the input language: The learners are more likely to fix the word order if a language does not have case. See the image below for the details of the study or download the poster as a pdf here. Feedback welcome! Fedzechkina, M., Jaeger, T. F., and Newport, E. L. 2011. Functional Biases in Language Learning: Evidence from Word Order and Case-Marking Interaction. Proceedings of the 33rd Annual Meeting of the Cognitive Science Society (CogSci11), 318-323. This entry was posted in articles, Papers, Presentations, etc., presentations and tagged artificial language learning, case-marking, cogsci, Fedzechkina, language acquisition, LSA, Newport, word order. Judith Degen, Masha Fedzechkina and I just came back from Ohio State’s linguistics departments, where we had a great time presenting and discussing our work. Masha gave her first talk ever, presenting her work within the artificial language learning paradigm on functional biases on acquisition (an extension of her LSA poster, soon to be posted here). Judith gave a wonderful guest lecture for Shari Speer’s introduction to psycholinguistics. She talked about scalar implicature and her work with Mike Tanenhaus on this topic. Since even I got it (and I am well-known to be pragmatically challenged), I can highly recommend her slides on scalar implicature processing (beware it’s a monster file – click and go grab a coffee). Thanks to everyone there for great and insightful conversations and for organizing this. I was particularly excited to hear about potential applications of Uniform Information Density to natural language generation (please keep me posted!). Oh, and extra big thanks to Judith Tonhauser and her fat white cat. This entry was posted in Papers, Presentations, etc., presentations and tagged artificial language learning, Degen, Fedzechkina, Ohio State University, psycholinguistics, scalar implicature.